A recent art project points to the nature of art as the “intersection of many human needs,” to paraphrase a quote by contemporary artist Carl André. 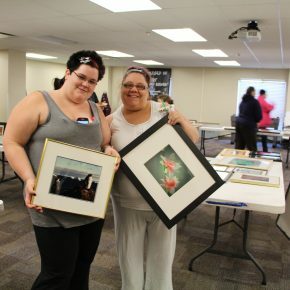 “Art in Your Home” provides a rare opportunity for people living in transitional housing to own an original work of art, bring art to populations often excluded from the art world – those living in poverty. 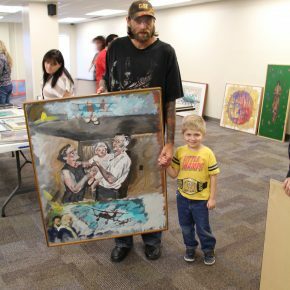 On September 12, the Utah Division of Arts & Museums (UDAM), partnering with The Road Home, gave away 112 unclaimed paintings, drawings, and prints to the residents of Palmer Court, a permanent supportive housing complex for individuals and families that have experienced chronic homelessness. The facility is managed by The Road Home. For Felicia Baca, manager of visual arts for UDAM, the project was the culmination of a vision she had after joining the division a few years ago. As she and other staff members searched without much success for artists who had never claimed their artwork submitted for exhibits going back as long ago as 30 years, she began to think of the abandoned art as an enrichment opportunity rather than a storage problem. At the time, however, there were other priorities and the project stayed on the back burner until early this year. One woman, said Baca, spent almost the whole time slot deciding between two pieces. One was a painting of a church and the other a portrait of a woman who looked a bit like her. In the end, she selected the church painting because of the memories it evoked. Another resident who is legally blind arrived with a written list of things she likes — barns, horses, and western scenes. Baca helped her pick out a painting of a barn. She held it very close to her face to study it and finally decided to take it. 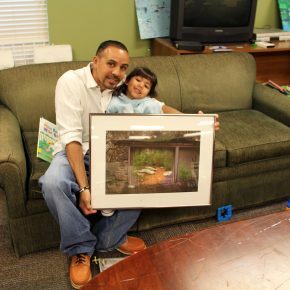 Residents responded with gratitude to this unusual opportunity to own an original work of art. One resident, named Jennifer, said, “I totally appreciate the time and effort people took to make this happen.” She added that she has never been to an art museum. In addition to being able to pick a piece of art, she appreciated seeing so many different kinds of artwork.